It’s not often we write about Turkish desserts or sweetie goodness on this blog because neither of us has a particularly sweet tooth. However, as Ramazan Bayramı is once more upon us and, as this is the time when people tend to indulge in foods of the sugary variety, now seems like the perfect time to just celebrate a few Turkish desserts you might come across when in Turkey…because even if we don’t eat them, we still take photos of them. Some Turkish desserts (or just downright sugary indulgent snacks) have appeared on the blog before. Others are photos that have never seen the light of day here. Well, for those of us that much prefer a steak to a cake, we often resort to taking photos of other people’s – friends’ – forays into the world of high sugar intensity. And Turkish cuisine is not shy when it comes to sugar! Let’s lose ourselves in a heavenly cloud of gooey, chocolatey, syrupy delectability…if you like that kind of thing. We had to kick off with baklava. There can’t be many people in the world who have ventured forth for a visit to Turkey and not tried at least one little pastried, syrupy section of this world famous treat. Gaziantep, in the southeast of Turkey, is the baklava capital and it was awarded protected status by the EU commission in December 2013. Think pistachio, walnuts, cinnamon, sometimes cardamom, sometimes butter, yufka…syrup. Seriously, why it’s served as a Turkish dessert in restaurants is a mystery to us. One piece will keep you going for a while all on its own! Lovely with a blob of ice cream on the side though, it has to be said. Hugely popular in Turkey, tulumba and lokma are perhaps the sweetie treats me and Barry have consumed the most of over the years we’ve lived here. This is because it’s easy to buy this one as a street food from portable stands and it’s often made in huge quantities at special occasions. Lokma is the ball-shaped dough, deep-fried and dunked in syrup. Tulumba is a more elongated shape – again, deep fried and dunked in syrup. Both are crunchy on the outside, soft and syrupy through their centre; they’ll make your teeth buzz and, if you’re not careful, as you bite into them and hear the satisfying ‘pop’ of the crunchy coating, the syrup will also ‘pop’ out and go all over your top. Just a warning for you, there – not good when you’re walking along a public street. Collectively, these little doughnut-type sweets are sold as tatlı. Look out for the guys with glass karts wandering the streets shouting ‘Tatlıcı’ and you can soon be feasting on it. Read our post about our experiences of eating tatlı. If it’s all getting a bit heavy and syrupy for you, let us refresh your palate for a moment. This is bici bici. It’s a southeastern dish again, and apparently, these days, is made more as a street food rather than in the home. A firm, milk-based corn starch base with crushed ice and rosewater. Not my thing – I guess you either love rose-flavoured food or you don’t – but if we have friends out to visit and they insist we have a dessert, Barry prefers this one. And the (fun) warning for this Turkish dessert – it tends to stain the lips pink for a short while. But very refreshing on summer evenings. Oh look, we’re back to syrup-soaked sweetieness. We told you sometime ago about our Turkish friend deciding we needed more education in the world of Turkish desserts. He just knocked on our door one day, we put the kettle on, made tea and he provided a cake box – one half was filled with kalburabastı and the other half contained rectangular wedges of şam tatlısı. Maybe these two Turkish desserts shouldn’t be grouped together but we ate them together on that day so they will be forever associated with each other, for us. They’re both a syrup-soaked sponge – the şam tatlısı was more lemony and therefore tasted lighter – şam tatlısı is from the southeast and therefore pistacchio-based and kalburabastı has the walnut. And we actually made a similar (but nut-free) cake ourselves a while back. This is the only Turkish dessert recipe on our blog but we’re still proud of our minor achievement. Here’s our easy Süzme Yoğurt Tatlısı recipe. Guess we should experiment further in the art of producing a homemade Turkish dessert! Famous to Antakya, we’ve written about sharing künefe in the past. It was actually at Ramazan Bayramı two years ago – see, we must have had Turkish desserts on the mind back then, too. This is a hearty dessert centred around syrup (again), cheese and shreds of kadayıf dough. You can see photos of künefe by clicking the link above. In the meantime, though, this is a very short video we filmed earlier this year, showing how the kadayıf dough is produced. More of a batter mix than a ‘dough,’ and always fascinating to watch. There must be an art to this. So we have the same type of batter mix again for the kadayıf. Cevizli taş kadayıf suits my palate more because it’s not super sweet. Inside these two little pancake parcels are small walnut pieces and cinnamon flavours. And of course, as this is another dish from the Hatay region, we have the almost obligatory crushed pistachio topping. No complaints from us. Served warm, again with a blob or two of ice cream…yummy! Yes, by now, some of you must be thinking, “Can’t you just get a cream cake or a chocolate cake in Turkey? Is it all pastry nuts and syrup?” Those of you who love a gateaux or other creamy cakes will be very pleased to know there is no shortage of pastane outlets in Turkey. In the pastane, you will find all manner of gooey goodness. Just like this gooey goodness, for example. This is a close up of two big fat wedges of chocolate profiterole cake that we had the pleasure to delve into recently. It was a birthday cake gift for Barry – and the few of us who were present made short work of it, we can tell you…with the excuse we didn’t want it to melt in the heat of the sun, you understand. 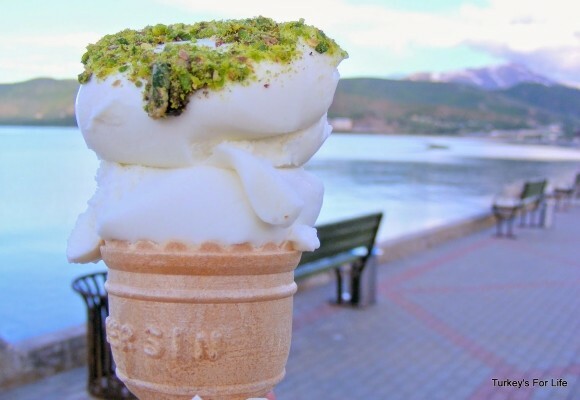 In Fethiye, you can buy cream cakes and profiteroles, etc, from places like Baba Fırın and Saliha Sultan. Well, you can always brave a performance from the guys who sell Turkey’s famous Kahramanmaraş ice cream. Eventually, you’ll be presented with your ice cream, and yes, of course, you can have it topped with crushed pistachio nuts if you like. Well, a Turkish dessert just wouldn’t be the same without them. It would be remiss of us to neglect one of the more famous sweety treats of Turkey, wouldn’t it, eh? Who doesn’t know about Turkish Delight? We know it’s not strictly speaking part of the group of famous Turkish desserts but it seems silly to write about foods of the sweet variety and not include lokum (the correct name for Turkish Delight). Visitors to Turkey will see gift shops with truly fantastic displays of all varieties, shapes, sizes and flavours of lokum. It’s probably one of the most popular souvenirs for taking back home to workmates. 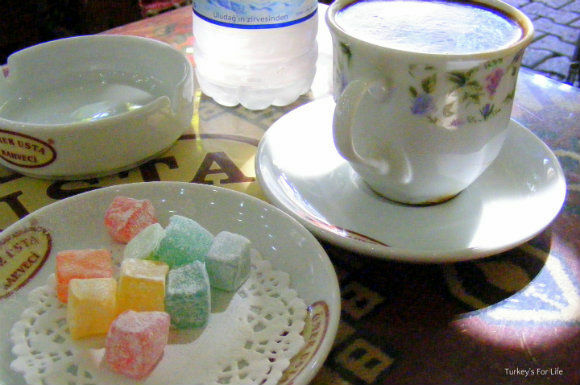 In Turkey, little cubes of lokum are often served as a side to Turkish coffee, like in the photo above. This was a special Turkish coffee we had in Izmir. It’s sometimes served when the waiter brings your bill to your table at restaurants or, if a shopkeeper is feeling generous, they will have loose pieces in a box for you to take as you’re being served. Of course, there are oodles of other Turkish desserts and sweet snacks to be enjoyed throughout the country. These are just a few we’ve photographed over the years. More than enough sugar and calories to be going at for now, though, don’t you agree… Don’t forget, we have lots of Turkish meals you can cook yourself at home, both savoury and sweet. Oh. You really have me drooling. I love Turkish desserts and the sweeter the better. In fact I think cakes should always make you pull funny faces. All a bit to sweet for me. A nice bit of cheese and a crispy apple are more to my taste. Great article….it also made my mouth water. 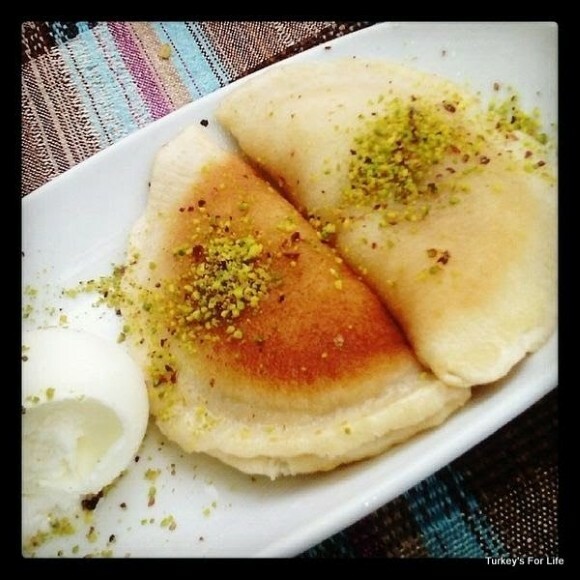 My favorite is Kunefe but I think I would try everything except the Baklava….not a favorite. Thanks for making me smile and for wishing I were back in my beloved Turkey…. this was a really nice article to read!